← Teach the next generation. 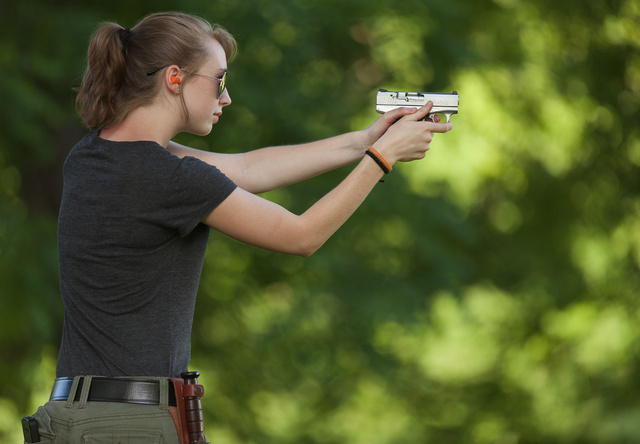 Recently, I had a chance to fire a few rounds through one of the Boberg XR45-S prototypes. It’s a controlled-feed bullpup pistol with 3.75″ barrel is a short 5.77″ slide. I wrote about it in detail earlier. For scale, Sarah is about 5’1″ and under 100 pounds. Subjective impression from firing 230-gr ball ammunition: about the same as shooting 9mm 147gr subsonics through CZ75 Compact. Slightly more muzzle rise, slightly less push against the palm. I could fire a hundred rounds without tiring. Considering how subcompact M1911s with shorter 3-inch barrels jump on recoil, this is quite an accomplishment. The pistol is fractionally larger than the 9mm version and less pocketable, so I’d like to see it available with a longer slide. It’s already available with extended barrels, but those don’t increase the sight radius. A version similar to 9L, with roughly a 4.45″ barrel would be my top choice, but this current variant is still quite nice. Better performance than the traditional micro 45s, and rated for 45 Super. This entry was posted in pistol and tagged 45ACP. Bookmark the permalink. Earlier, young Sarah was sporting a Sykes, now she has a USMC Kabar on the hip. If she pulls out an original chopped ’03 bayonet, I’ll be impressed enough to marry her. She likes fixed blades. I have not seen the short ’03 on her, but I’ve seen plenty of other interesting knives. I would have done a feature, except she’s a private person when it comes to some of her blade preferences.